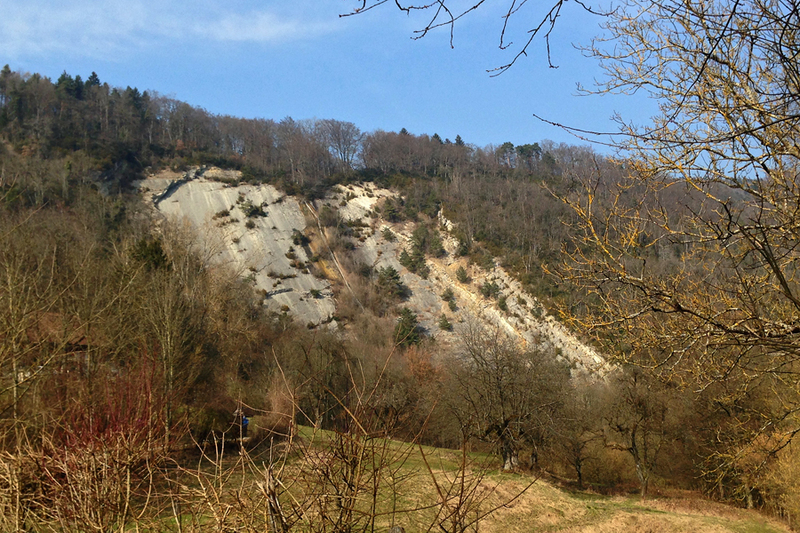 The weather report wasn't great for the Alps, so we'd figured we'd go do a bit of climbing in the Jura. 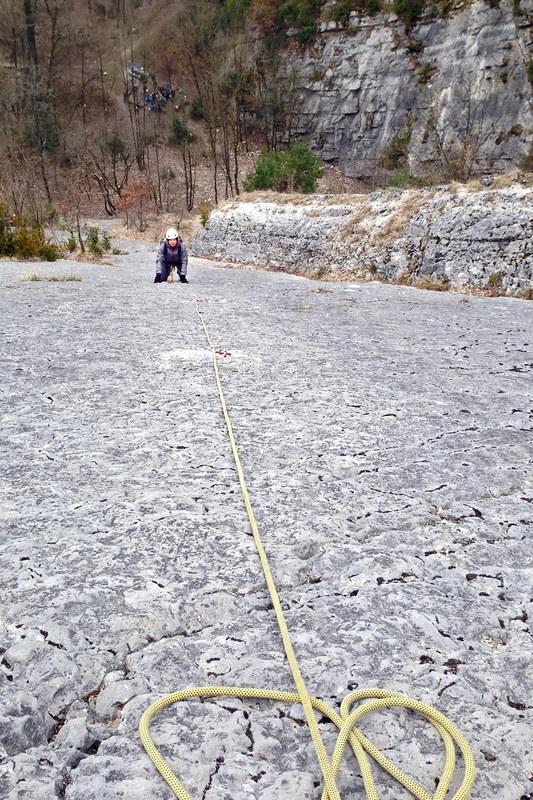 The slabs outside of Oberbuchsiten have been on our list for a while as a good place to go practice our multi-pitch technique. We assumed that we'd have the place more or less to ourselves given the fact that we got there early and that it is still March. Hah! wrong! We arrive at the wall and the parking lot is already more than half full. The klettergarten area has a group of adults and kids and, horror of horrors, the half of the wall on the other side of the waterfall, the one with the multi-pitch routes, is also full of kids. ack! Luckily there is one route free (the rightmost one). We take that one. We're into it enough now that the climbing is pretty easy (max 4c, not too steep, excellent footing, hands really required only for balance), so we can focus more on the multi-pitch aspects and dealing with the rope. It's fun climbing, despite the cold (it's not a warm day and the sun isn't out yet). We make it up the five pitches in around an hour. We're five minutes too late to be the first ones down the abseil route. Rather than wait for the large group of kids to finish, we opt to walk down. Back at the bottom all the routes are open, so we opt to go up again. This time we take the leftmost route, which is just as fun as the other was. It's not challenging, but boy is it fun. This time we're also alone at the top, so we can do the abseil route without waiting. It takes us a couple of transitions to get this smooth too, but by the time we get to the bottom we've got it mostly down. After lunch we think about going up again, but it's a bit crowded again, so we opt to just head home.